The hills and valleys of New England are dotted with living prayers of stone (Ceremonial Stone Landscapes) created by the Indigenous peoples of this region. These stone structures were built to create and restore harmony between human beings and Mother Earth. The prayers that they embody continue to live as long as the stones are kept intact. As the town of Sudbury, Massachusetts is experiencing firsthand, and as has happened on countless occasions in other places like Standing Rock, new natural gas and electric transmission lines are being proposed and developed without meaningful consultation with the Native American tribes, resulting in the possible desecration of sacred sites of historic, religious, and cultural significance. In response to Eversource’s proposed Sudbury to Hudson Transmission Project, the Town of Sudbury and local nonprofit Protect Sudbury invited regional tribal experts Doug Harris and Bettina Washington (Historic Preservation Officers for the Narragansett and Wampanoag Tribes) to conduct a preliminary walkthrough and assessment of whether Eversource’s proposed clearing might impact sacred ceremonial stone landscapes. 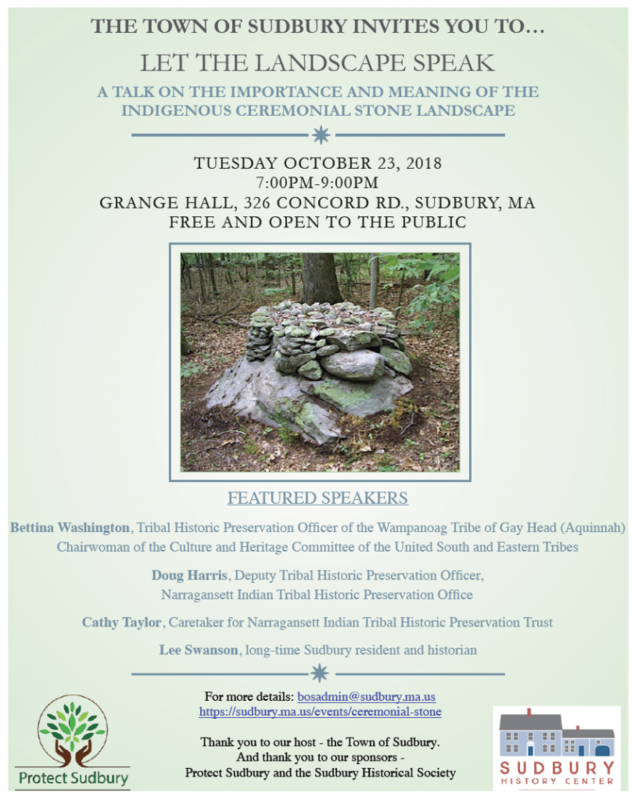 On October 23, 2018 at Grange Hall in Sudbury, MA from 7 to 9 pm, the Town of Sudbury, in conjunction with its sponsors Protect Sudbury and The Sudbury Historical Society, will host a panel of experts led by Bettina Washington to educate the Sudbury community on the presence and meaning of sacred ceremonial landscapes in our community, the important place in history that the Town of Sudbury holds for the Indigenous peoples of the Northeast region, and to share insights from the preliminary walkthrough along the proposed Eversource project path as well as research that has been conducted on known Indigenous ceremonial sites in Sudbury. It is our sincere hope that the Sudbury Community will join us for an evening of educational enlightenment and a renewed resolve to protect and preserve these sacred landscapes and our treasured cultural heritage. This event will be recorded by SudburyTV and will be available on-demand.